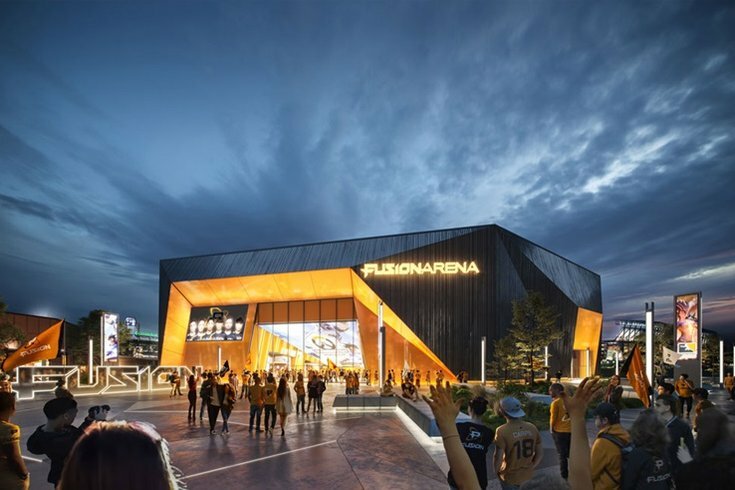 Comcast Spectacor and The Cordish Cos. announced Monday they are building a $50 million esports arena called The Fusion Arena, the first of its kind, in South Philadelphia near the sports complexes there. Construction of a $50 million esports arena in South Philly will begin this summer, Comcast Spectacor and The Cordish Cos. announced on Monday. The Fusion Arena — one of the first, dedicated esports venues in the U.S. — will seat 3,500 video-game spectators nearby to the Wells Fargo Center, Lincoln Financial Field, Citizens Bank Park and Xfinity Live! in the South Philly Sports Complex. Comcast Spectacor already is working on some other pricey projects on the 47-acres of the sports complex. The Wells Fargo Center is undergoing a renovation and a $80 million office tower is in the works, too. This new, mixed-use 60,000-square-foot venture — the site on which it will be built is currently a parking lot — will surely usher in a new era for the popular esports entertainment industry, where gamers compete tournament-style often in front of large crowds. Comcast Spectacor owns the Philadelphia Fusion, which competes in the Overwatch League. Executives are hoping it will become a hub for esports gaming on the East Coast. Inside, the venue will include a 10,000-square-foot training facility, two balcony bars, a broadcast studio and premium seating that could be used for events like concerts and corporate events. The venue's projected opening is 2021.